Get this on-the-go reference to appreciate the breadth and depth of the Loire Valley’s stunning, under-appreciated wines. Wine guides for the ultra curious, Approach Guides takes an in depth look at a wine region’s grapes, appellations, and vintages to help you discover wines that meet your preferences. The Loire Valley — featuring a compelling line-up of distinctive grape varieties, high quality winemaking and large production volumes — is home to some of France’s most impressive wines. Nevertheless, it remains largely overlooked by the international wine drinking public. This makes the region a treasure trove of exceptional values, just waiting to be discovered. Grape varieties. 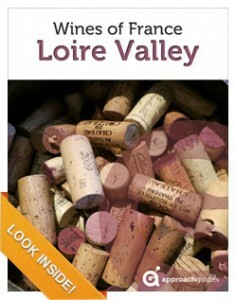 We describe the Loire’s primary red and white grape varieties and where they reach their highest expressions. Vintage ratings. We offer a straightforward vintage ratings table, which affords high-level insight into the best and most challenging years for wine production. A Loire Valley wine label. We explain what to look for on a Loire Valley wine label and what it tells you about what’s in the bottle. Map and appellation profiles. Leveraging our map of the region, we provide detailed profiles of appellations from all five of the Loire’s sub-regions (running from west to east): Pays Nantais, Anjou, Saumur, Touraine and Central Vineyards. For each appellation, we describe the prevailing terroir, the types of wine produced and what makes them distinctive. A distinctive approach. 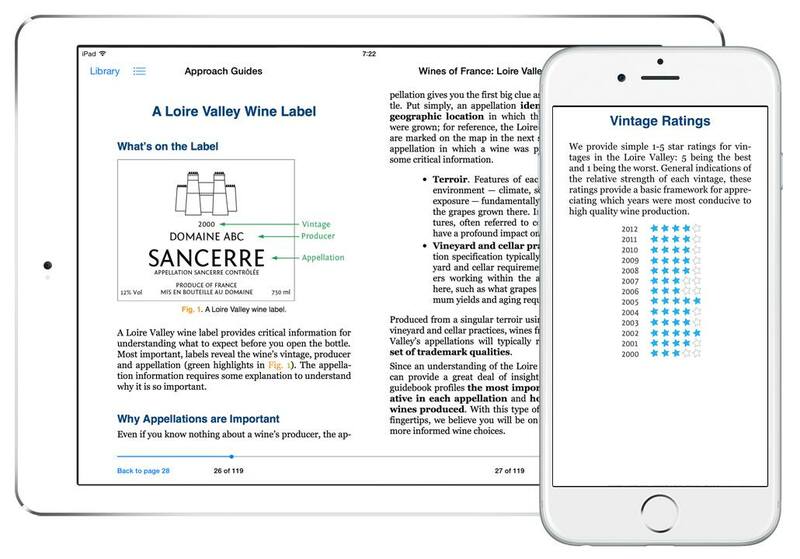 This guidebook’s approach is unique: rather than tell you what specific bottle of wine to order by providing individual bottle reviews, it gives the information you need to make informed wine choices on any list. Recommendations. We mark our favorite appellations with asterisks (*) — our selections have a record for providing quality, consistency and good values. Information the way you like it. As with all of our guides, this book is optimized for intuitive, quick navigation; information is organized into bullet points to make absorption easy; trademark features of grapes and denominations are front and center. 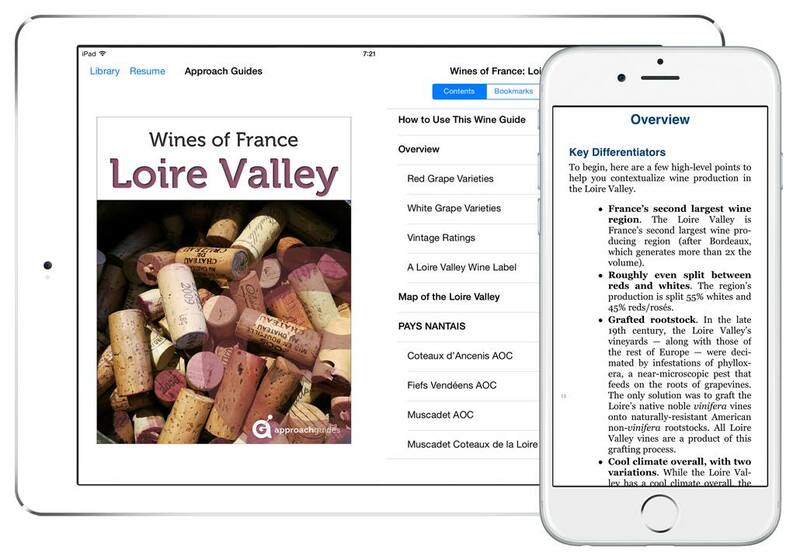 In addition to our wine-focused guidebooks, Approach Guides also offers a wine app for the iPad and iPhone (pictured at right). Visit wine.approachguides.com for more information. 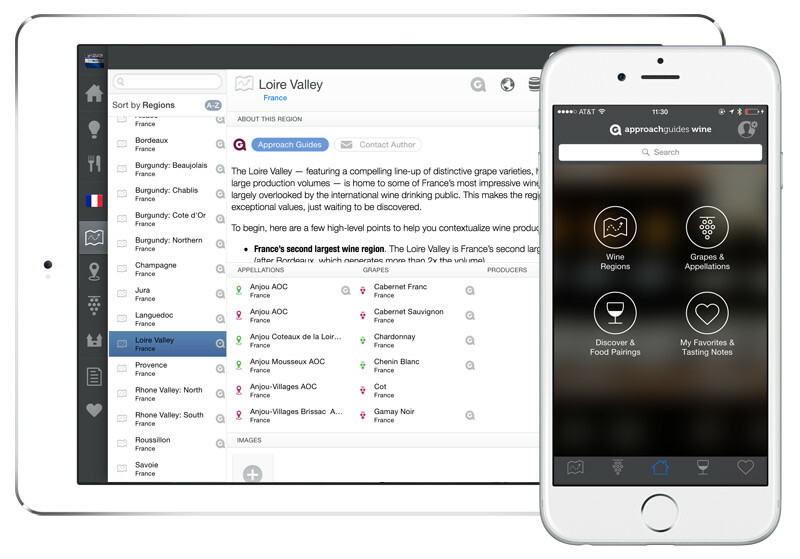 The Approach Guides wine app enables users to make informed wine choices by providing detailed, country-specific profiles of regions, appellations, grape varieties and vintages.